If you’ve come this far, you just might be ready for what’s coming. It’s the core and kernel of… well, everything on the planet. In the discussion on how to obtain good health, tangential mention was made of westerners as health care clients. In order to intelligently view the subject of payment, we must look a little deeper into this phenomenon. Regardless of our personal beliefs, we live within the influence of a Judeo–Christian culture. Most of us were raised within this construct, and its influence is deeper than we imagine. This presents some unique obstacles to the objectives we presumably wish to attain. Missing from this worldview is an acceptance and understanding of karma, or simply, the concept of cause and effect. Since our culture, as a whole, does not believe in karma, cause and effect, reincarnation, and the wheel of eighty-four, it considers itself to be free from these realities. This perspective also conveniently allows the wayward mind to avoid yet another annoyance in life: personal responsibility. Why do you suppose we have created such a litigious society, with a law for every nuance of life? Simply because, we, as a culture, exercise no personal responsibility. ‘The land of the free’ — bastion of liberty! We're free to do anything we want. Right? This is the illusion we must confront in order to understand who pays for the self–created privilege of good health. Freedom, to the mind, implies freedom from responsibility. “I’m freeeeeeee! Ha ha ha!! !” Responsibility means work, accountability, effort, discipline — sometimes even sacrifice. “No thank you,” says the mind. This is completely backward. Embracing this illusion can only bring slavery. And, although there are plenty to choose from, I can think of no better example of slavery in this culture than our health care system. Shouldn't Health Care Be Free? When we turn our backs on our responsibilities, we are simultaneously surrendering our freedom to someone or something else. Freedom is only acquired when we fulfill our responsibility to experiencing it. And, if you contemplate this, much, much more in terms of financial, physical, mental, emotional, and spiritual freedom. Is this true or not? If you have health insurance, and you reply that the above is not true, then reading further is pointless. These freedoms, in American health care, are gone. History. Non-existent. Kaput. Extinct. Vanished. Because Americans, collectively, have surrendered our freedoms in exchange for the illusion that someone else is paying for our health care. to pay fortunes of additional funds to reward CEOs and shareholders for limiting your access to the care you want. Do you call that freedom? You’re doing this with your money? Are you nuts?! NO ONE IS GOING TO PAY FOR YOUR HEALTH CARE. NO ONE. NO GOVERNMENT. NO CORPORATION. NO ONE. You are going to pay for your health care. No one is going to do anything for you without extracting a very high price. Everything is one's own responsibility — from health care to virtually everything we experience throughout each and every day. Ever hear the name, Benjamin Rush? 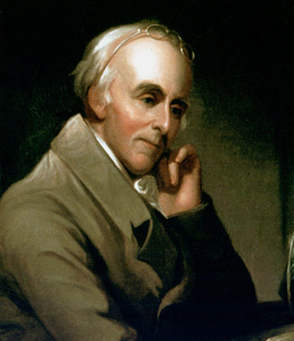 Recognized as the father of American psychiatry, Benjamin Rush was a physician and visionary of his time. He was a signer of the Declaration of Independence. But all you really need to know about Benjamin is the foresight he expressed regarding medical freedom and the human tendency toward tyranny. Needless to say, this wisdom was not included in the Constitution. And Dr. Rush's words are far more poignant today than they were at the birth of our nation. Effective health care is now locked away in the Bastille, and, as in 1789, only the people can restore our access to it. What passes for health care in this country is nothing more than bureaucrats, bean counters, and salespeople practicing an ineffectual form of medicine without a license. The American public has not only handed them the right to do this and get away with it, we've actually paid them for that favor. Actually, the salespeople do have a license. It entitles them to prescribe powerful toxins with great authority and demand the removal of disobedient organs and glands. It’s time to wake up. If you’re giving your attention to the debate on "health care reform", you may as well be watching some lame television show. (I'd name one, but I'm happy to say I don't even know names of television shows.) If you truly believe the political farce on stage at the capitol has anything to do with improving your health, then the despotic powers Benjamin Rush warned us of have you right where they want you. We must first turn off the faucet which is draining our income into the pockets of the crooks who define and extort health care. Only you can do this. Once the faucet is turned off — whatever that means in your life — we need to consciously, intelligently, judiciously begin making the decisions we have previously turned over to others. We have to engage in the long and sometimes frustrating search to find a system of medicine and a practitioner actually offering a path to genuine good health. We need to commit to acquiring the education, treatment, guidance, and understanding such a system offers us. These treasures are unobtainable in popular culture. Then, and only then, can we watch the full value of our hard earned dollars being leveraged to our own advantage, in health. Open your eyes, please! Look around. Start taking responsibility for your actions and health! Create a revolution in your own life. And watch the entire world transform. These things take time, energy, attention, and, yes, money. Put yours where it serves you. Life is slipping away as you read this. There is much to be undone. In alignment with these realities, Future Medicine Now is a cash practice. We accept cash, checks, Visa, and MasterCard. We do not allow the influence of insurance companies in the office. We do this for reasons other than our dislike of exhausting resources to fight stupidity, ignorance, and greed in order to be poorly compensated for our services. The choices we offer facilitate your choice to take the actions suggested above. We personally, by choice, do not have ‘health care insurance’, but we enjoy excellent health care from each other and the select group of professionals with whom we associate. And we take genuine pleasure in being responsible for the level of health we experience. The concept of catastrophic health care insurance, in and of itself, has merit. The idea of pooling small amounts of money from many, to be disbursed to a few at times of epic crisis seems worthy. If such a system could be administered without greed, it might have a good chance of success. But we are living in a world where greed will always exist. Yet the integration of personal accountability into such a system might outweigh the usual pitfalls. Even the Health Maintenance Organization is an intelligent idea. Once again, aside from rampant greed, the fatal flaw in the present incarnation of the HMO is that a lofty concept was implemented within a medical paradigm incapable of defining, understanding, or manifesting good health — much less maintaining it. How could anything other than failure be expected? Such a concept could only fulfill itself in the hands of a system of medicine which is fluent in defining, obtaining, and maintaining good health. And in order for such systems to enjoy an acceptable level of success, a very high percentage of participants must be taking personal responsibility for their health — at all levels. And this is where accountability for our choices has the potential to pay off even more handsomely. At Future Medicine Now, we are entertaining the concept of a propitious mix of parts of these concepts. Broadly speaking, it's an invitation only, annual plan enabling individuals and families to enjoy favorable rates on visits, treatment, and services, as well as premium level access to the doctors. Participation is contingent on a client's demonstration of commitment to health care principles espoused at Future Medicine Now. One of our long-term objectives is that such a highly qualified and low risk group would be attractive enough to a third party insurer to obtain favorable rates for optional catastrophic coverage of procedures of high tech conventional medicine, should it be desired. This program is in its formative stages. And reliable guidance in maintaining good health. Personal accountability for one’s choices. Diagnostic techniques which reveal subtle levels of disharmony as well as the true cause of obvious dis-ease. Physical modalities which restore balance to all systems of the body. Gentle, yet effective herbal medicine which enables the body to perform its intended functions. Personalized guidance in maximizing these modalities with supportive choices in daily life. Continuing education which empowers the client to intelligently co-create a desirable state of health at all levels. Remember, if you are paying for ‘health insurance’, you probably can't afford health care.